When your smile is injured, incomplete, or otherwise struggling, these difficulties can bleed into other aspects of your everyday life and wellbeing. At Willow Run Dental Association, our dentists have experience with a wide variety of damage, from minor cavities to extensive tooth loss. Our quality restorative dentistry services can replenish your smile’s natural strength, ability to function, and aesthetic appearance in lasting ways. If you have any questions or concerns about our offerings, please feel free to contact the dental office in Auburn, ME and speak to a team member directly. Have you lost one or more of your natural teeth? Do you have tooth that’s badly weakened, fractured, or aesthetically imperfect? A custom-made restoration can be the perfect fit for these types of concerns. 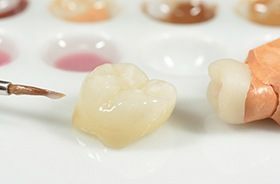 Dental crowns (also sometimes referred to as “caps”) are individual additions that are designed to cover the entire visible shape of a single tooth. This approach has a two-pronged effect – not only is the remaining structure well-preserved, but the tooth’s original shape and strength is replenished comprehensively. Alternatively, dental bridges are called as such because they quite literally “bridge” the gap left by one or more consecutively missing teeth. This type of prosthetic is anchored in place with the help of two dental crowns, one positioned over an adjacent tooth on either side of the gap. Cavities are one of the most common dental problems imaginable – in fact, over 90% of the population here in the United States will experience one or more over the course of their lives. Although it will always be ideal to prevent this sort of damage altogether through dedicated oral hygiene, our Auburn team has an effective solution waiting in the wings when our patients do come to us for help with treating painful decay: tooth-colored fillings. Tooth-colored fillings are crafted from a flexible, metal-free material known as composite resin. This substance can be precisely matched to the shade of your natural enamel for a beautifully lifelike result, and it also bonds directly with the tooth enamel in order to create a more conservative and longer-lasting addition to the structure.